Yes, I am doing Blogmas. I've only just started this blog but I thought- hey, why not? Vlogmas are my favourite videos to watch on YouTube from about September onwards and I know people do- Blog your socks off September, Blogtober, etc. But for me I wanted to do Blogmas. I love Christmas and it made sense to me! Then I saw on twitter that Cole was doing a #BigBlogmasProject and thought it was a great idea and a fun way to get involved with a lot of other great bloggers. They're even doing twitter chats on Mondays and Fridays and you can follow their twitter here to be kept in the loop. So! Starting on the 1st of December I will blog every day until Boxing Day and I'm really looking forward to it. I already have a few ideas up my sleeve. 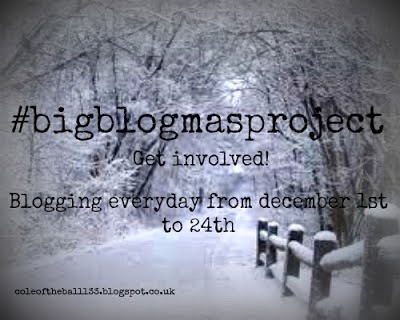 Are you doing Blogmas? Leave me links! Leave me ideas! Leave me requests! Cole, Lydia, Rebecca, Dixx, Kirsty, Celine, Kate, Hannah, Uggynog, AmyLou, Holly, Kel, Bex, Charlotte, Sammy, Sophie, Kelsey, Charlotte, Bethany, Jesslyn, Laura, Dayna, Eloise&Mary, Rae, Jessica, Courtney, Tara, Row, Danni, April, Jordan, Shaunie, Laura, Chloe, Gaby, Jess, Siobhan, Aaliyah, Steph, Sophie, Amelia, Jules, Rebecca, Cerys, Orla&Christine, Lora, Strawberry, Taylor, Marina, Lianne, Nikki, Kim, Maria&Pini, Alex, Lucy, Naomi, Sarah, Natalie, Elizabeth, Romina, Aqeela, CMWB, Ali, Halli, Charlotte, Kammi, Hannah, Kendal, Cailin, Shona, Victoria, Laura, Jess, Joni, Rodneya, Becca, Ambi and Beth.